The presynaptic neuron (top) releases neurotransmitter, which activates receptors on the postsynaptic cell (bottom). Neurotransmission (Latin: transmissio "passage, crossing" from transmittere "send, let through"), also called synaptic transmission, is the process by which signaling molecules called neurotransmitters are released by a neuron (the presynaptic neuron), and bind to and activate the receptors of another neuron (the postsynaptic neuron). Neurotransmission is essential for the process of communication between two neurons. 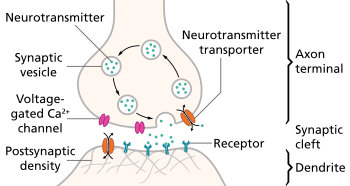 Synaptic transmission relies on: the availability of the neurotransmitter; the release of the neurotransmitter by exocytosis; the binding of the postsynaptic receptor by the neurotransmitter; the functional response of the postsynaptic cell; and the subsequent removal or deactivation of the neurotransmitter. Neurons form elaborate networks through which nerve impulses (action potentials) travel. Each neuron has as many as 15,000 connections with other neurons. Neurons do not touch each other (except in the case of an electrical synapse through a gap junction); instead, neurons interact at close contact points called synapses. A neuron transports its information by way of an action potential. When the nerve impulse arrives at the synapse, it may cause the release of neurotransmitters, which influence another (postsynaptic) neuron. The postsynaptic neuron may receive inputs from many additional neurons, both excitatory and inhibitory. The excitatory and inhibitory influences are summed, and if the net effect is inhibitory, the neuron will be less likely to "fire" (i.e., generate an action potential), and if the net effect is excitatory, the neuron will be more likely to fire. How likely a neuron is to fire depends on how far its membrane potential is from the threshold potential, the voltage at which an action potential is triggered because enough voltage-dependent sodium channels are activated so that the net inward sodium current exceeds all outward currents. Excitatory inputs bring a neuron closer to threshold, while inhibitory inputs bring the neuron farther from threshold. An action potential is an "all-or-none" event; neurons whose membranes have not reached threshold will not fire, while those that do must fire. Once the action potential is initiated (traditionally at the axon hillock), it will propagate along the axon, leading to release of neurotransmitters at the synaptic bouton to pass along information to yet another adjacent neuron. ↑ Holden, Arun; Winlow, William (1984). The Neurobiology of Pain: Symposium of the Northern Neurobiology Group Held at Leeds on 18 April 1983 (1st ed.). Manchester Univ Pr. p. 111. ISBN 0719010616. ↑ Purves D, Augustine GJ, Fitzpatrick D, et al., eds. (2001). Summation of Synaptic Potentials. Neuroscience (2nd ed.). Sunderland (MA): Sinauer Associates. ↑ Jin-Hui Wang; J. Wei; X. Chen; J. Yu; N. Chen; J. Shi (2008). "Gain and fidelity of transmission patterns at cortical excitatory unitary synapses improve spike encoding". Journal of Cell Science. 121 (17): 2951–2960. doi:10.1242/jcs.025684. PMID 18697836. ↑ Jiandong Yu; Hao Qian; Na Chen; Jin-Hui Wang (2011). "Quantal glutamate release is essential for reliable neuronal encodings in cerebral networks". PloS One. 6 (9): e25219. doi:10.1371/journal.pone.0025219. PMID 21949885. ↑ Jiandong Yu; Hao Qian; Jin-Hui Wang (2012). "Upregulation of transmitter release probability improves a conversion of synaptic analogue signals into neuronal digital spikes". Molecular Brain. 5 (26): 1–11. doi:10.1186/1756-6606-5-26. PMC 3497613 . PMID 22852823. ↑ Anderson, L. L. (2006). "Discovery of the 'porosome' The universal secretory machinery in cells". Journal of Cellular and Molecular Medicine. 10 (1): 126–31. doi:10.1111/j.1582-4934.2006.tb00294.x. PMID 16563225. ↑ Lee, Jin-Sook; Jeremic, Aleksandar; Shin, Leah; Cho, Won Jin; Chen, Xuequn; Jena, Bhanu P. (2012). "Neuronal porosome proteome: Molecular dynamics and architecture". Journal of Proteomics. 75 (13): 3952–62. doi:10.1016/j.jprot.2012.05.017. PMID 22659300. ↑ Trudeau, L.-E.; Gutiérrez, R. (2007). "On Cotransmission & Neurotransmitter Phenotype Plasticity". Molecular Interventions. 7 (3): 138–46. doi:10.1124/mi.7.3.5. PMID 17609520. ↑ Thomas, E.A. ; Bornstein, J.C. (2003). "Inhibitory cotransmission or after-hyperpolarizing potentials can regulate firing in recurrent networks with excitatory metabotropic transmission". Neuroscience. 120 (2): 333–51. doi:10.1016/S0306-4522(03)00039-3. PMID 12890506.